The A83 is a very important through road in Scotland and connects the Central Belt, via the A82 from Glasgow, with the south west of Scotland all the way down to Campbeltown Kintyre. The road starts in Tarbet at the junction with the A82, north of the Bonnie Banks of Loch Lomond. 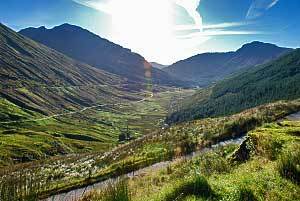 The A83 is a very scenic road, almost 100 miles long, and it brings you through some of the most beautiful countryside Scotland has to offer. Since much of this scenic road runs along the shores of Loch Fyne, the highest point is reached only ten miles after Tarbet at the famous pass called Rest and Be Thankful. This pass on the A83 is 245m above sea level and it divides Glen Kinglas from Glen Croe. On top is a viewpoint with beautiful views in Glen Croe where you can clearly see the old valley road which was engineered by General Wade during the subjection of Scotland following the Jacobite rebellion. A stone was erected to commemorate the completion of this military road in 1750. Rest and be thankful are the words inscribed on a stone near the junction of the A83 and the B828, placed there by soldiers who built the original military road in 1753, now referred to as the Drovers’ road. The original stone fell into ruin and was replaced by a commemorative stone at the same site. 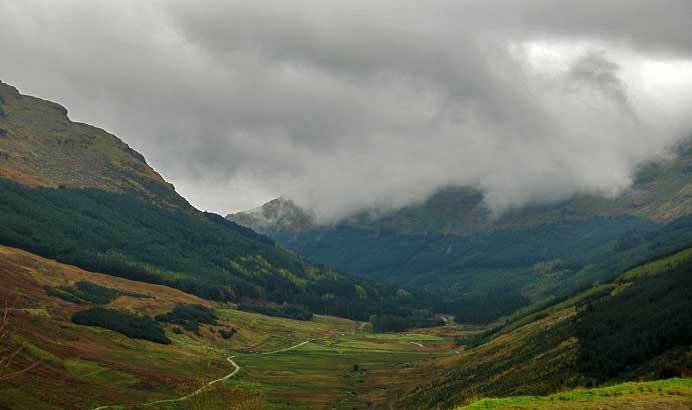 The weather in this area can play tricks with you, sometimes dark clouds and rain or drizzle accompany you while you drive west over the top of the pass when suddenly the sun comes out on the other side at Loch Fyne. 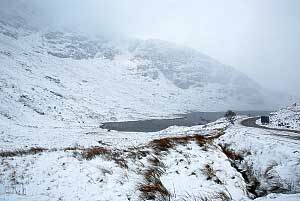 The high group of mountains, also referred to as the Arrochar Alps, are the reason for these rapid weather changes. 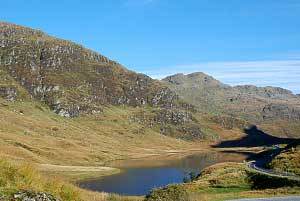 The Cobbler, or Ben Arthur, is one of Scotland’s most spectacular mountains visible from Rest and be Thankful. 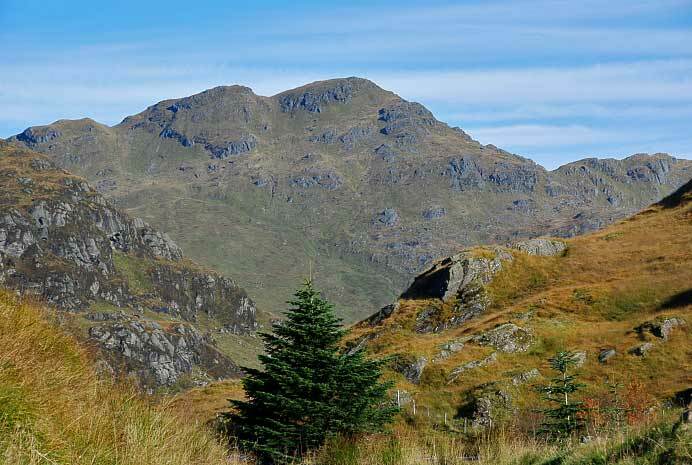 Ben Arthur is not the highest mountain of the Arrochar Alps, that is Beinn Ime with 1,011m a few miles further north. Both mountains are very popular with walkers. Recent landslides caused disruptions and there still is a possibility for landslides, although the constructed nettings on the slopes have already caught a few slides. There are detours available in case of a landslide. The old military road can be used during closures. This is a single track road so traffic travels in convoys. The longer detour if you come from Glasgow is to follow the A82 over Crianlarich, take the A85 direction Oban and continue on the A819 to Inveraray just outside Dalmally. This diversion will add 35 miles to your journey and most like more than one hour due to possible congestion of the A82 or A819.